We all know the dangers of air pollution and what it’s doing to our planet. But did you know the effect it could be having on your health? Research found that every year in the UK there are around 29,000 deaths that can be associated to air pollution. The number of cars on our roads is increasing all the time which is leading to more polluted roads. A study found that car drivers and passengers can be exposed to as much as 15 times more pollution than pedestrians and cyclists in the same areas. The most polluted area of a street is in the middle of the carriage way, where the drivers are. It would seem logical to believe that keeping your windows shut would stop these dangerous pollutants from getting into the car, but that’s not true. The air that comes through the air conditioning unit is sucked in from outside and most car air filters cannot trap these dangerous particles as they are too small. The FitAir® Car Air Purifier plugs straight into your cars cigarette lighter and ionizes the air which instantly gives you cleaner and safer air in your car. It works without any type of chemical and is silent. Simply plug into your cigarette lighter to regulate the production of ozone and purify the air in the car. Thanks to the disinfecting power of ozone, the air purifier helps clear the air of bacteria, viruses, fungi and pollen micro particles less than 0.5 microns (that is 200x thinner than a human hair) meaning virtually nothing is missed! Our air purifiers kill up to 99.9% of germs and bacteria in the air. This is perfect for the whole family, but especially useful if you have young children. Younger children cannot blow their own noses, and their understanding of hygiene is non-existent. You therefore have to do all you can to stave off illnesses caused by germs and bacteria, many of which float around in the air; preparing to attack your little ones limited defences and make their lives miserable! An in-car air purifier can help give you and your little darlings the very best chance of avoiding the many hundreds of common cold and flu viruses that circulate in the air. The FitAir® range offers outstanding protection for everyone from new-born babies to older adults. Air quality and children’s health directly reflect one another, this is why you will often see air purifiers in children’s nurseries; why should the air in your car be any different? We have done our research to create the best air purifiers for the whole home and then realised we needed to create something equally effective for your car too. The FitAir® Car Air Purifier - Air Ioniser protects you and the ones you love and gives you the FitAir® you deserve. 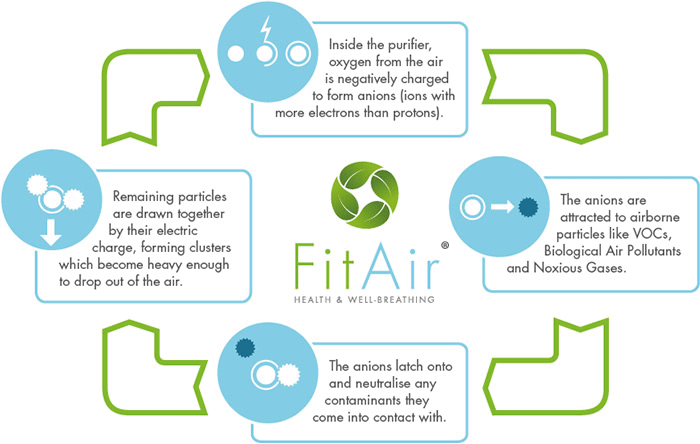 FitAir’s® negative ionisation technology has been specifically designed to safely and effectively eliminate the dangerous things lurking in your air, without simply masking the problem. Whilst filters are great at purifying the air which goes through them, they can’t clean the entire atmosphere in a room on their own. That’s why ion technology is increasingly being used to counteract this downfall, as it works on a molecular scale – targeting tiny airborne particles which can easily pass through filters. As well as making the air safer to breathe the FitAir® Car Air Purifier removes the particles that cause bad smells, leaving your car smelling as fresh as when it was new. Using the FitAir® for just 30 minutes can clean the air of up to 99% of airborne pollutants. After the air in your car has been cleaned of the harmful pollutants, all that remains is a microclimate full of active oxygen molecules which will leave you feeling energised even after sitting in traffic for an age! Because FitAir® relies on nature’s own methods of purification, there's no lingering artificial scents; just the crisp smell of fresh, breathable air. The summer months can really feel like hell if you suffer from allergies. They flare up when the pollen count is high but staying inside doesn’t help! When it gets a bit hotter your first thought is to crack open a window but if you suffer from hay fever you will have to decide if you prefer being hot and sweaty or having red, puffy eyes as pollen can be blown into the building through open windows. Air conditioning isn’t the solution either, because air conditioning systems recycle air from outside, allergens can still get in and irritate you as most air conditioning units don’t have a filter to trap them. At home, pollen is easily carried indoors by pets, shoes and clothing as well, so no escape there. Once blown inside there's a much higher concentration of these little allergens which then lead to hay fever, asthma, and rhinitis symptoms. A FitAir® unit deals with the allergens themselves so that you don’t have to choose between feeling refreshingly cool and free from sniffles and sneezes. When summer finally comes to an end you would think that would be the end of you air related problems but no, winter brings its own issues in terms of air quality and pollution. As the cold nights draw in we spend as much time inside as possible so you need to ensure the air is fit for you to breath. Winter brings with it cold and flu for a lot of people, the viruses that cause these illnesses become trapped in our homes making recovery from them more difficult, using a FitAir® unit will take these out of the air to stop you feeling bunged up. Learn more about the VOC’s in your home that can be damaging you and your family’s health here. Plug-in air purifier for your car, cleans air without using harmful chemicals neutralising strong odours - IT REALLY WORKS!